If you’re interested in Olympic archery, you’ve definitely come to the right place. We’ve dug deep into the history, current trends, and inner workings of the sport’s inclusion in the Olympic Games, and have some details that might just surprise you. 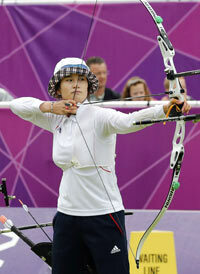 Keep reading for more knowledge about archery’s place in the Summer Olympics. Despite its prevalence in history, especially Greek history, archery didn’t make its appearance in the first Olympic Games, which happened in Athens, Greece in 1894. Instead, the sport entered Olympic competition in Paris, France, in 1900. Six different events, from varying distances, took place. Only men competed in this first rendition of Olympic archery. In 1904, during the St. Louis-hosted Olympic Games, six archery events happened. These differed from the events that took place in 1900, and included both team events and women’s rounds. However, no athletes attended from outside the United States. The sport of archery wasn’t represented in the 1912 Olympics in Stockholm, Sweden, but it did reappear for the 1920 Olympic Games in Antwerp, Belgium. In Belgium, 10 events took place. These included large and small bird shoots, along with moving bird targets from 28, 33, and 50 meters. Team events also happened, but the competition was limited to men only. During archery’s early history in the Olympic games, participation was sparse, at best. Only three nations typically contested archery during each Olympic Game, and only the United States competed in 1904. Other nations that competed in archery during the early years were France, Belgium, the Netherlands, and Great Britain. From 1900 to 1920, a total of 65 Olympic medals were awarded to archers from around the world. In 1920’s Antwerp games, bronze medals were not awarded for some events due to light competition. Here’s a breakdown of the countries competing in those early Games, and medals awarded. 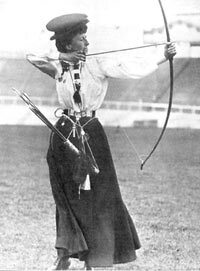 After 1920, archery was removed from the Olympic Games for 52 years. In 1931, seven nations founded the Fédération Internationale de Tir à l’Arc, or FITA, in Lwow, Poland. The nations included France, Czech Republic, Sweden, Poland, the United States, Hungary, and Italy. 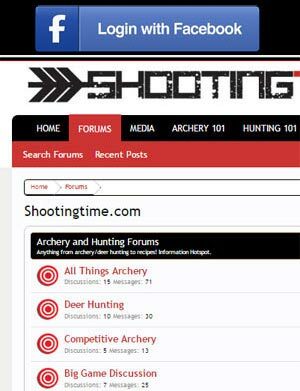 FITA’s aim was to create regular archery championships, and see archery return to the Olympic Games. 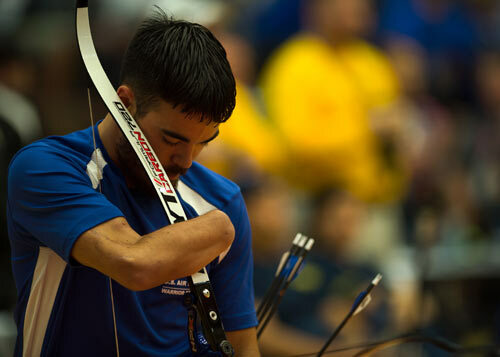 FITA, now called the World Archery Federation, held, and still holds, a World Archery Congress every two years. The first motion of the World Archery Congress was to put a request to the International Olympic Committee to reintroduce archery to the Olympic Games. The organization’s efforts would not prove successful until 1972’s Munich games, when archery was finally modernized and reintroduced to the schedule. With archery’s resumption as an Olympic sport in 1972 came a new format and set of rules for the sport. Based on the guidelines already set in place by FITA, the competition was at first divided into two medal events: a men’s individual and women’s individual. Each competition featured a double FITA round, now known as a 1440 round, shot from 70 meters. Many nations began to compete in Olympic archery, as did the original quintet of countries from the sport’s earlier years. FITA, renamed world Archery in 2011, organized the events, set the rules, and provided qualification guidelines as well as judges for the event. To this day, World Archery continues to govern archery as a sport in the Olympic Games. While World Archery competitions include both recurve and compound bows in their events, the Olympic Games are different. 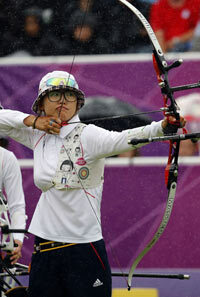 For Olympic archery, participants can only use a recurve bow. The recurve bow is the modern evolution of traditional bows, which have been used around the world for thousands of years. For men, the recurve bows have a draw weight of, on average, 48.5 pounds. Women’s bows draw an average of 33 pounds. Brady Ellison, the top American male archer heading into the Rio games, typically draws 53 pounds. Mackenzie Brown, the only American female who went to the competition, draws 46.5 pounds. The bows are typically 70-inch takedown recurves, meaning the limbs can be removed from the riser. These recurves are allowed to have a mechanical sight, but no optical enhancements. 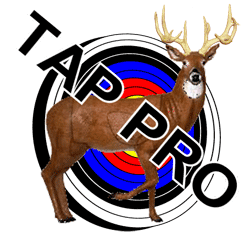 Archers are also allowed to use top and bottom stabilizers, ranging from 12 to 15 inches long. Clickers, which help an archer release the string at the same spot during the draw process, are also permitted. For Olympic medal competitions in archery, the Archery Olympic Round is currently used. 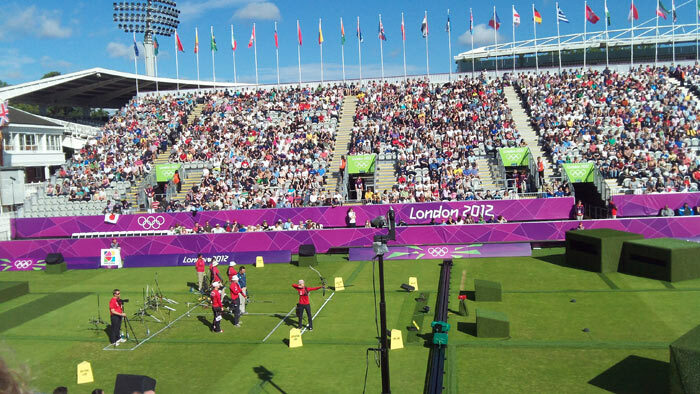 This was introduced to make the sport more watchable as a competitive event, and was developed by World Archery. 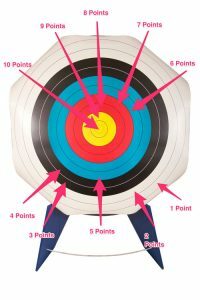 Since 2010, the Archery Olympic Round has used a sets system instead of a 12-arrow match. The distance for this round is 70 meters. The target is a five colored target that is 122 centimeters in diameter. There are ten scoring rings, which are each 12.2cm in width. Each color consists of two rings. The inner color, gold, scores 10 or nine points. Red rings are worth eight or seven points. Next, the blue rings score six or five points and black scores four or three points. Finally, white scores two or one point. First are the ranking rounds. Athletes shoot 72 arrows, in ends of six, and the total scores rank the archers from one to 64. This provides the seeding for the elimination brackets. In the next phase, elimination rounds are comprised of sets of three arrows each. Two athletes shoot against one another, and the loser leaves the competition while the winner advances to the next round. Archers have 20 seconds to shoot each arrow, shooting in turns of one arrow each. Athletes win two points if they have the highest score in the set, and each athlete is awarded one point if the set is a draw. The first athlete to six points wins the match. During the gold medal final, two athletes remain. They shoot a match, and the winner is awarded the gold medal while the loser will receive a silver medal. The two semifinal losers compete for the bronze. Each team is made up of three athletes of the same gender from the same country. The combined ranking round score of the three athletes is used to rank the teams from one to 12, giving the seeding for the elimination brackets. These brackets progress like the individual competition. Team matches are also decided using the set system, but with six arrows instead of three. Arrows are shot in groups of three, alternating between each group. Every athlete in a group must shoot an arrow, but they can fire in any order. After the first team completes its group, the second team shoots. Finally, both teams repeat the process for a second group. The team with the highest score receives two set points. If tied, each team receives a point. Like in the individual competition, the first team to six set points wins the match. The match consists of four ends of two arrows each for each archer. This means a total of 24 arrows are shot. The team has two minutes to shoot all six arrows. In the event of a tie, each team is allowed one minute for each team member to shoot an arrow. The team with the highest total score is the winner. Archers must be at least 16 years old to compete in the Olympic Games. Rather than qualification slots being given to individual athletes, they’re allocated to National Olympic Committees, or NOCs. NOCs earn qualification spots in two ways, by team or by individual. For each gender, an NOC can send three archers to compete with a team qualification spot. Each of those archers will also compete in the individual events. NOCs earning individual qualification spots are limited to a single archer in that event. There are a total of 12 team qualification spots for each gender. The host nation automatically gets a spot, and the top eight teams from the World Archery Championships get slots. The Final World Team Qualification Tournament is the source for the final three team slots. An additional 28 individual qualification spots are up for grabs for each gender, bringing the total number of competitors in each individual event to 64. Between five and eight of these spots are awarded at the World Archery Championships. Additional spots are awarded through continental qualifying tournaments, and at least three spots are allocated to a Final World Individual Qualification Tournament. Finally, three places for each gender are reserved for the Tripartite Commission invitations. From 1972 until 2008, the first elimination round would pit the first-ranked archer against the 64th, the second against the 63rd, and so on. Archers would simultaneously shoot 18 arrows in three-arrow ends. The archer with the highest score after 18 arrows would move on to the next round, while the loser would be eliminated. During the quarterfinals, semifinals, and medal matches, called the finals rounds, things changed. Each archer would shoot 12 arrows, again in ends of three. Instead of shooting simultaneously, archers in the match would alternate by arrow. The losers of the quarterfinals were eliminated, while the losers of the semifinals would compete against each other to determine the bronze medal and fourth place. The winners of the semifinals would face each other in the gold medal match, with the winner taking the gold and the loser earning the silver medal. In 2008, all matches were completed using the finals round format utilized from 1972 until 2008, shooting 12-arrow matches alternating by arrow. For the 2012 Olympic Games, the individual match system was completely overhauled. The single-elimination with the bronze medal match was retained, but all matches came to consist of sets of three arrows each. The point system described earlier in the page determined rankings and match winners. Since the Olympic team title was introduced in Korea in 1988, South Korea’s women have never lost the team gold medal. They’ve earned eight gold medals in the team competition, and South Korean female archers are also awarded a large portion of the individual gold medals. The South Korean men don’t do so bad, either, but they aren’t the stellar competitors that their female counterparts seem to be. The world record for the men’s ranking round was set at 700 points out of 720. That record happened at the 2016 Rio Olympics, and was achieved by South Korean archer Kim Woo-jin. South Korean archers hold a number of other world records in Olympic archery, including the 18-arrow match and 12-arrow match in men’s competition and almost all of the records in women’s Olympic archery. To be fair, South Korea’s Park Sung-hyun shares the record for the 72-arrow ranking round with Ukraine’s Lina Herasymenko (673 points out of 720). The next Olympic Games, in 2020, will take place in Tokyo, Japan. 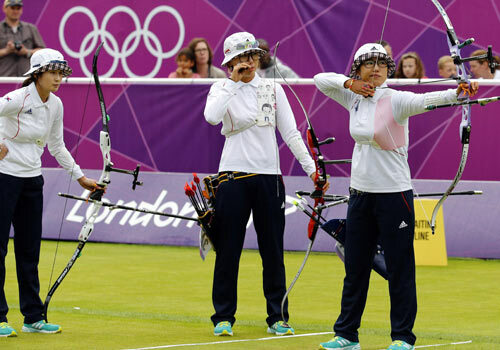 Archery is expected to be a big draw for the games once again, with South Korea’s Ku Bon-chan and Chang Hye-jin defending their titles. We can’t wait to watch the fierce competition and see if the South Korean women retain their team title.